but the sound of this artist will literally change the lives of people everywhere! Atlantas rising star, Terrel Edwards is a new artist with a new vibe and whether its a dance oriented up-tempo cut or a slowed-down, silky smooth ballad; Terrel manages to deliver a soul-stirring message in each melody. Terrel debuts his freshman CD, SACRIFICE, in October 2004, with something for everyone. 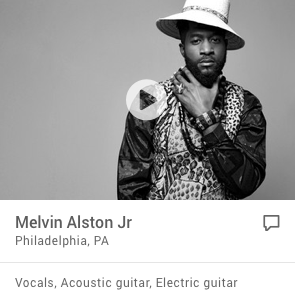 His captivating, melodic style, vocally rich, jazzy overtones and mesmerizing, three-octave vocal range captures the essence of everything we love about soul music. Countless nights of immersing himself into the musical masterpieces of his inspirations, Babyface, Luther Vandross, Marvin Gaye and Curtis Mayfield has cultivated Terrels musical depth and style to serve as mere footprints of the heartstrings of these great legends. Perhaps the secret to his talents is hereditary. His father, a Quartet leader, instilled the love of music in Terrel from birth. At the age of 10, Terrel began to mesmerize all that were in earshot of schools and the local churches in his hometown of Milwaukee, WI. By age 12, he had already developed a thrilling stage presence, and relentlessly enhanced his musical abilities through vocal training. This same enthusiastic young man has now grown into a musically seasoned vocalist who has chosen to deliver sweet melodies to the masses. Music is Terrels passion and a constant burning in his soul caused this self-taught keyboard player to pursue fluency on the saxophone and guitar. Instrumentally, he is sound and his ambition knows no bounds! Terrel has demonstrated that when one chooses a road driven by their passion, success is just down the hill and around the corner. You can add Songwriter, Producer and Actor to Terrels credit. Not only did Terrel pen the majority of Sacrifice, Terrel has written hot lyrics for Pop artist Sera, whos debut release is rapidly climbing the charts and gaining popularity in London and abroad. Terrel and Sera will simultaneously release their own versions of a duet titled, "When You Love Someone", which is sure to touch the heart of all who have experienced true love. Another bad creation, Waiting, Anticipating, was featured on the soundtrack for the motion picture Little Man for Grip Productions. Terrel writes, arranges and produces for other professional vocalists, who appreciate his diversity and gifted ear. Terrel is currently working with a major TV network, NBC, on writing for several childrens shows. Terrel made his acting debut with Bill Nunn (Spiderman II) and was featured with Today Show host, Al Roaker, on "Traveling with Al Roaker". Terrel has captivated audiences at over 100 venues in the United States and South America and his audience continues to grow with weekly performances in Atlanta and the Southeast. Terrel has worked with several Artist in a variety of genre, including Keith Sweat, Michael Bolton, Athena Cage and Eric Benet, just to name a few. Terrel gives his all at every opportunity. He has donated his time and talent to various social causes, such as the Sickle Cell Foundation, Black Engineers Scholarship functions and "Real Men Cook" a nationally recognized non-profit organization that raises mad dollars. Terrel enjoys giving other artist the opportunity to exercise their gifts and talents by signing other acts to Giayn Entertainment while still continuing his passion for song writing and performing. Music lovers worldwide have long awaited the likes of an artist with the conviction to create, compose, and communicate from his soul. The exhilarating sounds of Terrel will free your mind.